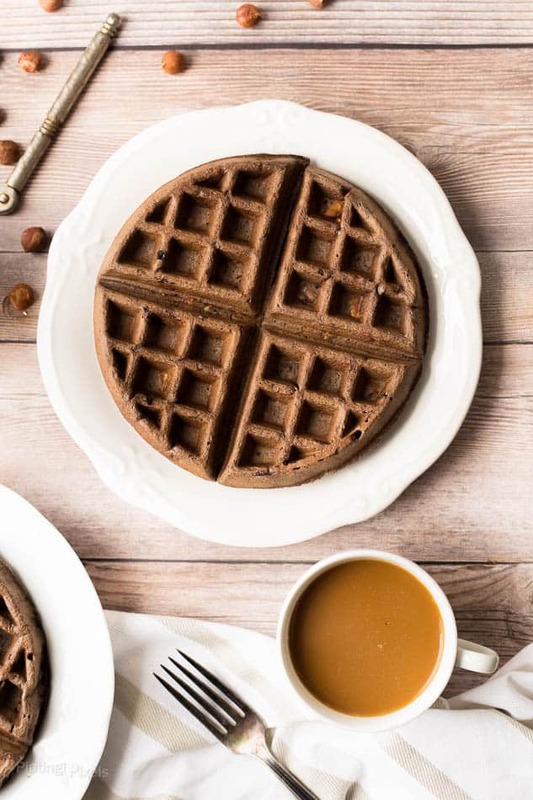 Easy gluten free Chocolate Hazelnut Waffles are a decadent treat with peanut butter, dark cocoa, oat flour, banana, honey hazelnuts and hazelnut creamer. Full of fiber, protein and complex carbs. Within this post you’ll make chocolate hazelnut waffles you can feel good about. Plus you’ll learn how to get perfect waffle batter consistency and how to keep waffles crispy while baking a large batch. If I were to tell you that you could enjoy Chocolate Hazelnut Waffles as a filling, balanced, nutrient rich breakfast you’d probably think I was mistaking it for a dessert recipe. 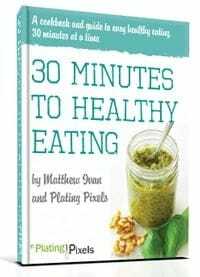 Far from it actually; this wholesome waffle recipe is made up of pure, simple ingredients that aren’t processed or full of added sugars. Plus it’s rich in flavor, full of fiber, protein and complex carbs. Waffles are a favorite breakfast of mine, especially when you make them yourself with ingredients you’re proud to include. To make these gluten free, oat flour is used as the main base. A bit of baking powder and eggs helps them rise into fluffy, moist waffles. To sweeten them I used ripe banana and honey. Olive oil adds moisture and a great alternative to canola oil or butter. These wouldn’t be Chocolate Hazelnut Waffles without chocolate or hazelnut! Instead of adding sugar and calorie dense chocolate chips, a bit of dark baking cocoa goes a long way. Just a quarter cup turns these into a rich, decadent brown color and adds chocolate undertone. Chopped hazelnuts, plus hazelnut coffee creamer, are the other stars of this gluten free waffle recipe. 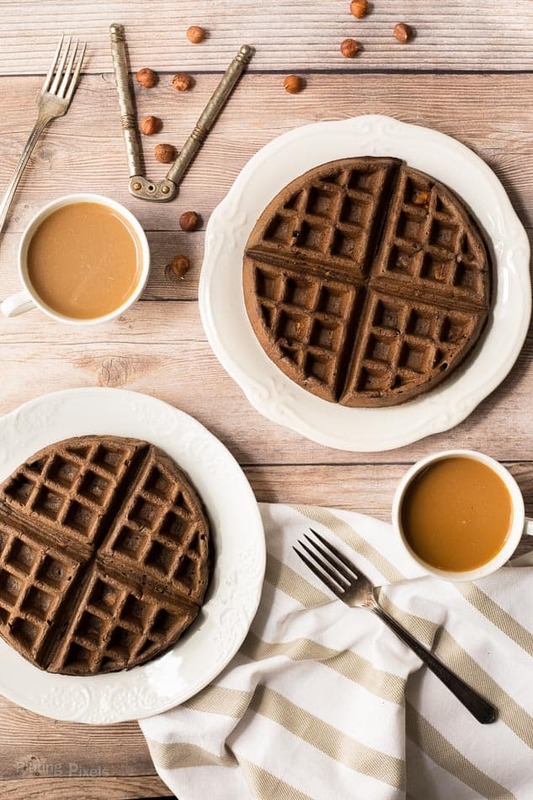 It adds rich, sweet, creaminess to these Gluten Free Chocolate Hazelnut Waffles, as well as your everyday coffee. What is correct consistency for waffle batter? It should be thick but still slightly runny. If batter is too thick add more milk, if batter is too thin add more flour. Waffle and pancake batter is pretty forgiving in it’s ratio of ingredients. You can add extras such as peanut butter, banana, creamer and cocoa powder as in this recipe. This allows for almost unlimited variations and flavor combinations. To keep waffles crispy while cooking a large batch, store cooked waffles on wire rack in oven at 200° F. This prevents them from getting soggy. Instead they stay warm and crisp, without drying out. Decadent waffles with peanut butter, dark cocoa, oat flour, banana, honey hazelnuts and hazelnut creamer. 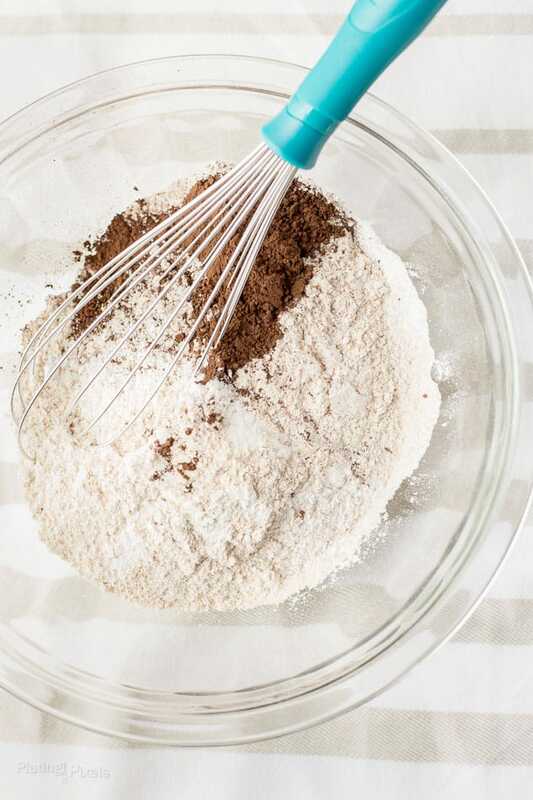 In a large bowl, combine oat flour, baking powder, cocoa powder and salt. Whisk together to combine then stir in hazelnut pieces. In separate medium bowl, whisk the eggs. Add remaining ingredients and whisk until completely combined. Pour into dry mixture. Stir together until just combined, small lumps in the batter are fine. Let the batter sit and thicken for 10 minutes while you heat up waffle iron. Pour about ½-cup batter into center of heated greased waffle iron. Cook each waffle according to waffle iron directions, usually 3-5 minutes. To keep waffles crisp while cooking large batch place them on wire rack in oven at 200 F.
Your photography is hands down AMAZING! Thanks you so much Jennifer! How sweet of you! These sound amazing!! Can they be made with wheat flour as well? Hi C! I’ve made similar waffles with wheat flour and it works fine. Should be able to keep the amount the same. Thanks! These look scrumptious! I am a huge fan of the chocolate/hazelnut flavors (I always have some Nutella on hand) and I can’t wait to try these! I seem to always have it on hand too! Can’t go wrong with chocolate and hazelnut. Thanks Emily! Thanks David! It’s a wonderful combo, but often only used it desserts. Works awesome in waffles too! Those waffles look really good! I need to make them! Oh yum! These sound delicious! I can’t wait to get a waffle maker soon. My kids keep asking for me to get one. I bet they would go crazy for chocolate waffles. I got one as a gift and wish I had gotten myself one sooner. I love having the option to make them! Thanks Emily and enjoy! These look incredible! I need to try these out! Thanks and you totally should Rachel! These sound delicious! My kids go crazy for waffles (what kid doesn’t!?). Some great ideas to try next time we make them!! Haha I assume most kids would love waffles, I sure did! Hope the like them and thanks Mary! Waffles are one of my favorite recipes too! With chocolate and hazelnut (and especially peanut butter and bananas! ), I certainly want to try these out! They’re my favorite too! The combo of flavors works perfectly. Thanks Kelsey! Oh wow!! These sound sound yummy!! Oh my! These look amazing. Will have to pin this recipe for later. They sure are! Thanks Maggie! These look gorgeous! Thanks for the recipe! I can’t wait to try them! Thanks so much Amanda and I hope you do!